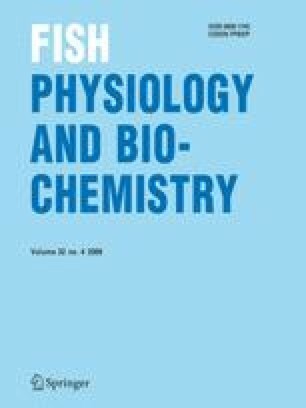 A full-length complementary DNA clone encoding copper, zinc superoxide dismutase (Cu, Zn-SOD), a key antioxidant enzyme, was isolated from the evolutionary lower vertebrate shark species, Scyliorhinus torazame. The shark SOD cDNA comprised 30 bp of 5′-untranslated region (UTR), 456 bp of a single open reading frame (ORF) encoding 152 amino acids and 401 bp of 3′-UTR, including consensus polyadenylation signal (AATAAA) and 20 bp of poly-(A+) tail. Deduced amino acid sequence of shark SOD shared relatively high identities with those not only from teleosts (57–72%) but also from other advanced vertebrates (53–65%) with intermediate characteristics. In addition, shark SOD represented unique molecular features that were not seen in other vertebrate SODs. The SOD transcripts were expressed ubiquitously in all tissues examined, including brain, intestine, kidney, liver, muscle and spleen, as determined by reverse transcriptase-polymerase chain reaction (RT-PCR). Acute exposure to cadmium by either injection (0, 1, 2 or 5 mg CdCl2 kg−1 body weight for 2 days) or immersion (0 or 25 μM Cd for 0, 1, 4 and 7 days) altered hepatic SOD mRNA level, based on RNA blot hybridization and semi-quantitative and/or real-time RT-PCR assays. Transcriptional levels of SOD were significantly increased by cadmium exposure generally in a dose- or time-dependent fashion. This work was supported by the Korea Research Foundation (Grant # KRF-2005-202-F00041), Ministry of Education and Human Resources Development, Korea.